NEW YORK (AP) — The annual Alfred E. Smith Memorial Foundation Dinner, a white-tie gala in New York that is often the last time the two presidential nominees share a stage before Election Day, is traditionally a time when campaign hostilities are set aside. Donald Trump and Hillary Clinton traded sharp barbs and brutal takedowns the night after their final debate, with many in the well-heeled crowd turning on the Republican nominee midway through his remarks and showering him with jeers. Trump, who had drawn big laughs earlier in the speech, appeared to lose the room as he repeatedly dug in with caustic swipes at Clinton, drawing rare boos at a charity event meant to raise money for impoverished children throughout New York. He appeared to straddle the line when he talked about how "listening to Hillary rattle on and rattle on" has made him better appreciate his former nemesis Rosie O'Donnell. But he then seemed to cross it when he referred to her as "corrupt" during a lengthy riff on the FBI's investigation into her use of a private email server as secretary of state. "Hillary is so corrupt she got kicked off the Watergate Commission. How corrupt do you have to be to get kicked off the Watergate Commission? Pretty corrupt," he said to loud boos and at least one call demanding he get off the stage. He then almost appeared to segue into the standard attack lines of his rally speeches, setting aside jokes to bring up material contained in hacked Clinton campaign emails. "Hillary believes that it's vital to deceive the people by having one public policy and a totally different policy in private," he said to growing jeers. "Here she is tonight, in public, pretending not to hate Catholics." Clinton also veered into personal digs, making one joke in which she said the Statue of Liberty, for most Americans, represents a symbol of hope for immigrants. "Donald looks at the Statue of Liberty and sees a '4,'" Clinton joked. "Maybe a '5' if she loses the torch and tablet and changes her hair." Trump and Clinton sat one seat apart for the evening, with New York's Cardinal Timothy Dolan acting as the only buffer. And when they entered and took their seats, they did not greet each other or make eye contact, though they did shake hands at the conclusion of the roast. Dolan later called his seat "the iciest place on the planet." Most eyes were on Trump, who infamously glowered through Obama's jokes at his expense during the 2011 White House Correspondents Dinner and is not known for being self-deprecating. Some of his jokes landed well, drawing laughs from both the crowd and Clinton. His biggest laughs came as he talked about Michelle Obama getting rave reviews for a recent speech. "They think she's absolutely great. My wife Melania gives the exact same speech, and people get on her case," he said to whoops and laughs. And some of his attack lines flashed a sense of humor that has been mostly absent from the grueling campaign. 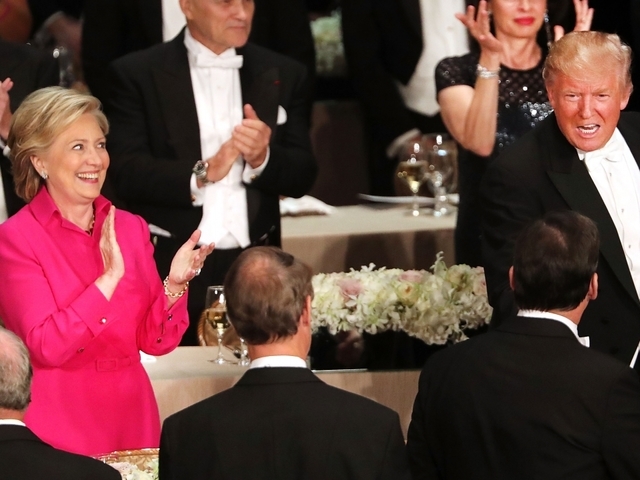 Clinton was the first one to laugh when Trump joked that she had bumped into him earlier in the night "and she very simply said 'Pardon me'" — an unsubtle reference to the Republican nominee's frequent declarations that his opponent should go to jail. Clinton, meanwhile, was more self-deprecating than Trump, joking that she's taken a break from her "usual nap schedule" to attend and suggesting that the audience should be pleased she's not charging her usual fee for speaking in front of potential donors. But she also got in some digs at Trump, a few of which drew scattered jeers. Clinton said she understood why Trump was leery of teleprompters because they can be difficult to follow and "I'm sure it's even harder when you're translating from the original Russian." The dinner is named after the former New York governor, who was the first Catholic to receive a major party nomination for president when he unsuccessfully ran in 1928. And fittingly for an event named after a man nicknamed "The Happy Warrior," the occasion has produced dozens of memorable presidential jokes — and sincere moments of goodwill that have remained largely absent from the 2016 campaign. "I can't wish my opponent luck," John McCain said in 2008, turning toward Obama, "but I do wish him well."